I’m really excited to launch this new feature… Jack (my very talented programmer husband), created this newfangled recipe browser. You can now search by season, special diet, meal type, ingredient… and, best of all, a combination of them all. I hope this makes for happier, easier searching! Click here to start browsing. (Or click the “recipes” link at the top of the page). Also, let me know if there’s a category/tag you’d like to see that’s not currently listed. AMAZING, Jeanine! It’s like Zappo’s for food and it’s a million times nicer to look at. Brilliant. High fives to your hubby! Wonderful — and I say that both as a foodie and as a designer. Intuitive, clean, beautiful. Excellent work by both of you. I only wish I had something as good on my blog. Any chance you’ll license it at some point? Please pretty please? wow, on the overview, your food photos just pop! Love your blog! Your recipes are great -unusual without being intimidating and your husband did a great job on the technical end! Thanks Carrie, that’s just the sort of thing I try for, glad to hear it’s coming across that way! Wow this really is amazing. Yours is my favourite food blog I’ve found as of late. And this recipe browser has just moved to the absolute top of my bookmarks list. Thanks for everything! Dang, this is so cool! Bravo, Jack! WOW! This is such an amazing feature. Thank you for making this or should i say thank you Jack. Such a great idea! This is wonderful! I’ve pinned nearly all of your recipes and have made a whole bunch of them, which is more than I can say for the 48 other food blogs I follow. Thank you for being so awesome! I am so jealous you have a programmer in the house. Oh the damage I could do. Love this! Is your husb shareable? I seriously can’t stop thinking of this amazing feature! It is so perfect. Tell your talented hubby I would seriously pay for this as a feature to add on to my own site. Okay, he is stupidly talented! This is the most awesome recipe index I have seen on any food blog, ever! Wow! This is wonderful! Props to the hubby! Oh you are so lucky your husband can do this stuff!! I am so jealous! You guys, this is amazing! I love how slick and intuitive this feature is, and it looks absolutely gorgeous. Nice work!! Super-cool! Second the license request. I hope you’ll consider it! Wow this is so amazing. 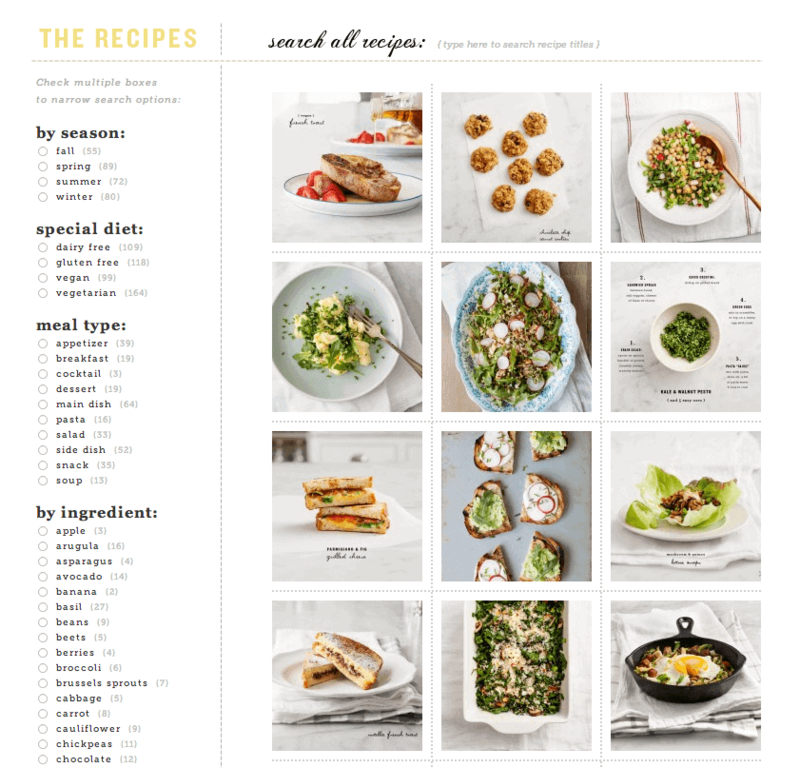 All your recipes are healthy, delicious and well crafted. I can’t wait to use this tool for those weeknight dinners when I can’t decide what to make. Great idea! Your recipe box is growing and growing! It will be nice to see all of them whenever I need them. Such a cool search functionality. I like that you can search by ingredient. Perfect when you have leftovers of something and need an idea of what to make. OHHHH, this is f a b u l o u s!!!!! Just want to say what a wonderful feature this is, thanks so much! Read tons of food blogs and this is super helpful and unique, great job!